Often in medical ethics, we discuss famous cases of persistent vegetative states such as Karen Quinlan, Nancy Cruzan, and Terri Shiavo. We explain that in a PVS there is no hope of recovery or even any return to consciousness. Of course, there are some stories in the news of people who were in comas for many years who finally awake, and we say that they must have been misdiagnosed. But Adrian Owen's book Into The Gray Zone shows that things are more complicated than we have been saying. He says that about 20% of people diagnosed as being in a PVS are in fact capable of experiencing what is going on around them and it may be possible to communicate with them. His book tells of his research about how to establish that communication. We are familiar with locked-in syndrome, where patients are completely paralyzed but are still conscious. Jean-Dominique Bauby described this in his memoir The Diving Bell and the Butterfly. He woke up after a stroke unable to move anything except for his eyes, and he eventually wrote his memoir simply by moving his eyes and interacting with a computer. Owen says that people in the Gray Zone may not even have that much ability, but can still have a conscious life. One of his main points is that it is far too simplistic to divide people up into a people who are in a PVS and those who are not. Rather than there being a uniform condition PVS that is the same for all in it, in fact every case is different. Each person with significant brain damage has a different set of deficits and a different chance of recovery. Probably the majority have no hope of recovery, but there is a significant portion of people diagnosed as being in a PVS who have some potential and can recover some abilities. So the very category of PVS is thrown into doubt as being a useful one. While most people whose higher brain functions seem to have ceased have no chance of any recovery, some portion of them can recover, and we need to be more careful about how we diagnose them, and we need to work on identifying those who are still conscious and find ways to communicate with them. Owen explains his research journey of investigating people who have suffered major brain damage. He started as a researcher in the UK at the University of Cambridge. Over his career he has moved around a good deal, and he is currently located at the University of Western Ontario. He tells his story by going through some of his most important cases and some of his own personal life events, including his relationship with Maureen, who he was once very close, and then split up with. Strangely, even though their relationship didn't last very long, she plays a significant role in the story. Owen also explains his intellectual journey of coming to think more carefully about the nature of consciousness and personhood. He describes some of his discussions with experts from psychology, neuroscience, and philosophy, bringing out the richness of the issues and the difficulty of achieving consensus. It's Owen's results that are the most striking. While these have been covered in many documentaries and in the news, they are still not widely appreciated. He has been able to communicate with people who were diagnosed with PVS though ever-increasingly sophisticated brain scans by telling them to imaging playing tennis if the answer to his question is yes, or imagining their homes if the answer is no. Different parts of the brain are involved in the different activities and it is possible for people to give answers to questions in some very rare cases even though there is no way for them to control any part of their body. 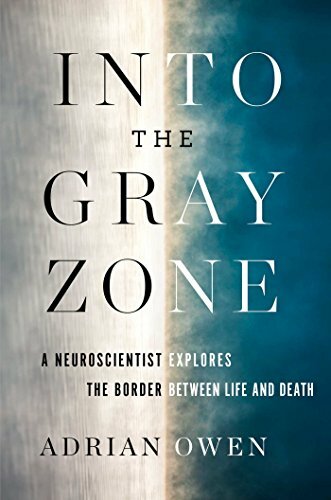 So Into the Gray Zone is a significant book for anyone interested in the varieties of consciousness, minimally conscious states, persistent vegetative states, and the way we deal with patients who have significant brain damage. It suggests that we should be much more careful in diagnosing and caring for people who seem to have lost consciousness. It is worth checking out the videos of patients on the website for the book. The unabridged audiobook is performed by Steve West with clarity and consistency that make the technical details easy to follow.